Only a few decades ago, the Brooklyn stereotype well known to Americans was typified by television programs such as “The Honeymooners” and “Welcome Back, Kotter”—comedies about working-class sensibilities, deprivation, and struggles. Today, the borough across the East River from Manhattan is home to trendsetters, celebrities, and enough “1 percenters” to draw the Occupy Wall Street protests across the Brooklyn Bridge. “Tres Brooklyn,” has become a compliment among gourmands in Parisian restaurants. In The New Brooklyn, Kay Hymowitz chronicles the dramatic transformation of the once crumbling borough. Devoting separate chapters to Park Slope, Williamsburg, Bed Stuy and the Brooklyn Navy Yard, Hymowitz identifies the government policies and young, educated white and black middle class enclaves responsible for creating thousands of new businesses, safe and lively streets, and one of the most desirable urban environments in the world. Exploring Brownsville, the growing Chinatown of Sunset Park, and Caribbean Canarsie, Hymowitz also wrestles with the question of whether the borough’s new wealth can lift up long disadvantaged minorities, and the current generation of immigrants, many of whom will need more skills than their predecessors to thrive in a postindustrial economy. The New Brooklyn’s portraits of dramatic urban transformation, and its sometimes controversial effects, offers prescriptions relevant to “phoenix” cities coming back to life across the United States and beyond its borders. "As 'gentrification' has become an increasingly dirty word, the volume of disingenuous posturing on the subject has increased dramatically, and the supply of balanced reporting has declined. One writer who has managed to speak sensibly above the din is Kay S. Hymowitz, a contributing editor at City Journal and a senior fellow at the Manhattan Institute. 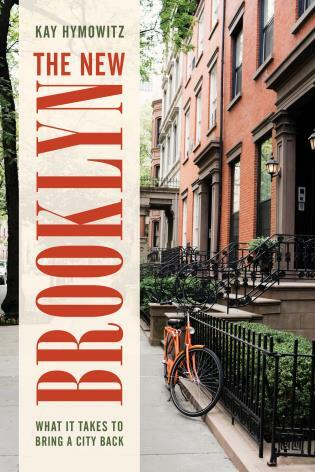 'The New Brooklyn' is her admirably clearheaded assessment of the borough that sometimes seems the epicenter of American gentrification." Kay S. Hymowitz is the William E. Simon Fellow at the Manhattan Institute and a contributing editor of City Journal. She is the author of 4 books including Marriage and Caste in America: Separate and Unequal Families in a Post-Marital Age, Liberation's Children: Parents and Kids in a Postmodern Age, and Manning Up: How the Rise of Women Has Turned Men Into Boys. She has resided in Brooklyn, New York since 1982.